Channelrhodopsins are light-sensitive receptors naturally found in certain algae. They are notable in the field of optogenetics because the transfection of channelrhodopsins into neurons allows the neurons to be depolarized using blue light. The video below demonstrates the use of blue light to stimulate channelrhodopsin-2 (ChR-2) proteins that have been artificially expressed in the membranes of neurons in the motor cortex of a live mouse. The experimenter is able to control the mouse's movement optically by using ChR-2 as a light-gated ion channel. 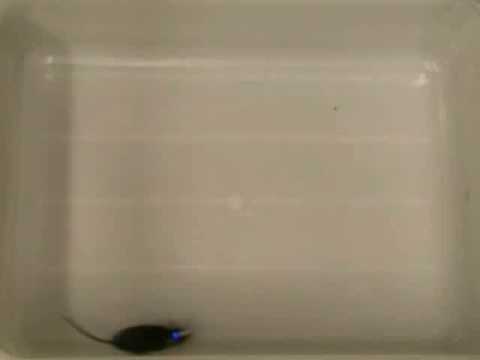 Since motor control is lateralized and only one side of the motor cortex has been transfected with ChR-2, the mouse involuntarily walks in a circle when the light is on, and can walk normally when the light is off. Demonstration of using ChR-2 to optically control neuronal activity in a mouse.